World number one Rory McIlroy is even more determined to cut back his 2013 competitive schedule after the disappointment of missing the cut in the defence of his UBS Hong Kong Open title. McIlroy four-putted the final green last Friday to miss the halfway cut by three shots. It was the second occasion this year the 23-year old has had to sit out the weekend rounds in the defence of a tournament after also missing the cut in June’s US Open defence at Sat Francisco. 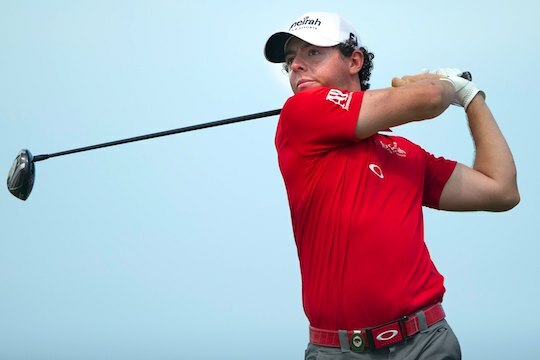 However before leaving Hong Kong and bound for Dubai, McIlroy indicated he’s learnt a further lesson ahead of sitting in coming weeks to work out where he will compete in 2013. “Of course, you’re going to miss cuts in your career but it’s not nice and it’s a tough pill to swallow when you’re the defending champion in a tournament,” he said. “But while there’s a part of me that perhaps wished my year had ended as soon as I wrapped up the Race to Dubai, I now look back over the last couple of years wondering why did I stretch myself so much. “I’ve probably played an extra couple of tournaments too much and I have learnt from the last few years so that’s why I’m cutting back my schedule even further from next year. In counting this week’s European Tour curtain-closing event McIlroy will have contested 24 tournaments along with participating in the Ryder Cup as well as teeing up in two exhibition tournaments – the Turkish Airlines World Golf Final and the recent showdown against Tiger Woods in the ‘Duel at Lake Jinsha’. McIlroy arrived in Hong Kong sounding tired after wrapping up the European Tour Race to Dubai title a week earlier with his third place finish in Singapore. And his well-being was reflected in his lethargic manner over the two days in Hong Kong that will now result in McIlroy cutting next year’s playing schedule by at least two events. “I’m not sure if the energy in trying to sew-up the Race to Dubai and competing in the FedEx Cup has taken more out of me than maybe I thought because while I am feeling okay physically, mentally I feel really tired,” he said. In comparison, McIlroy teed-up in 28 tournaments in his first full pro season in 2008 and then cut that by three a year later. Last year, he competed in 22 regular European and PGA Tour events but also teed-up in the Grand Slam of Golf, the World Cup, the Korean Open and joined three others competing over seven days on seven courses in the China Golf Challenge. And after taking home combined European and PGA Tour earnings of $US9,618,210 this season McIlroy will bank another US$1 million by just teeing up in Dubai. That is the ‘bonus pool’ first prize in capturing the Race to Dubai. The leading 10 Race to Dubai players at the close of next week’s US$8 million event will share an additional purse of US$3.75 million.